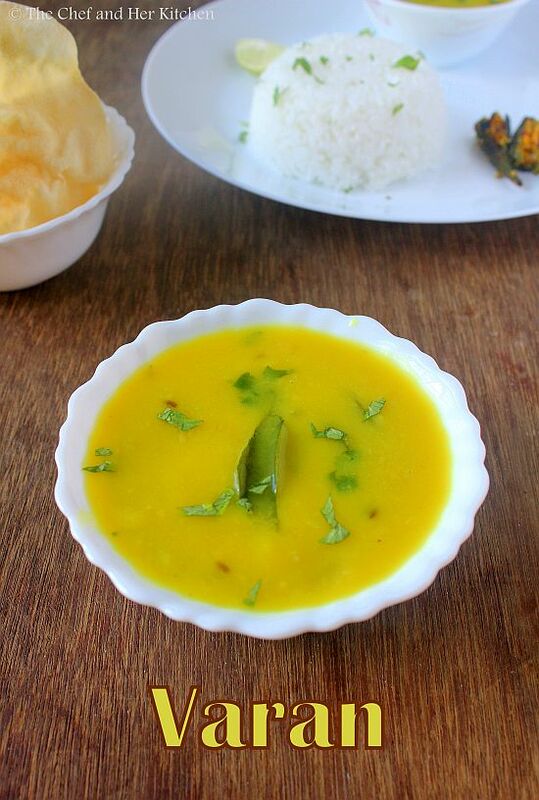 'Varan Bhaat' is a simple recipe that gets featured everyday in most of our houses with few variations. 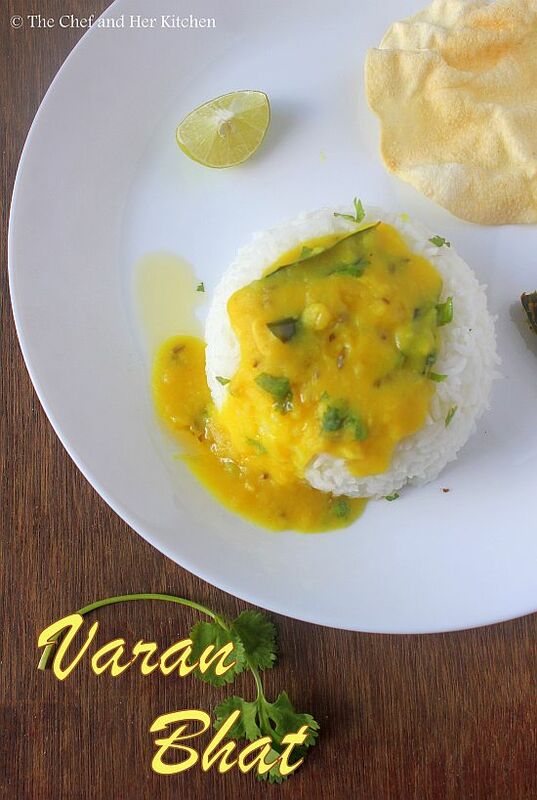 'Varan' means dal (lentil curry) where as 'Bhaat' stands for Rice. 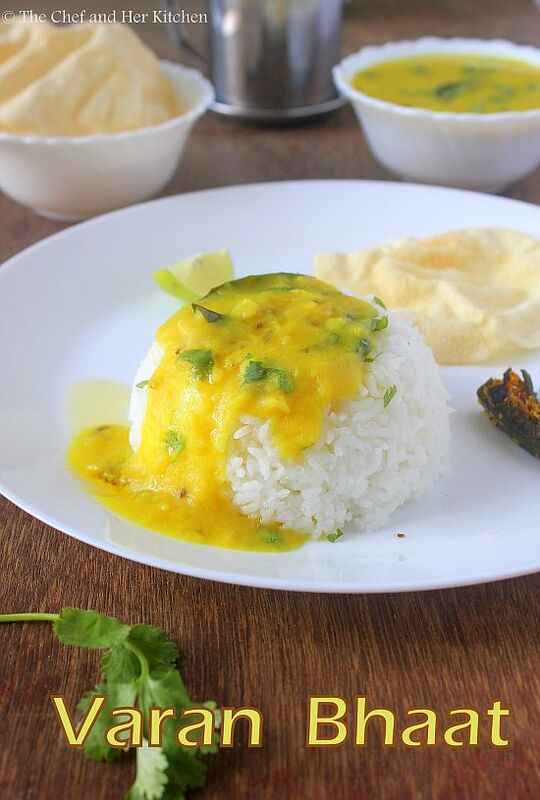 Varan Bhaat is most commonly offered to Lord Ganesha along with Modaks during Ganesh Chaturthi in most of the Maharasthrian homes.It is a tradition even at my place to offer a simple tempered toor dal to Lord Ganesha and it is also served as one of the side dishes during festivals and functions. There are so many variations to this simple Varan like the addition of tomatoes, garlic , red chili powder etc. I am posting a simple Varan recipe which one can alter according to their taste buds. 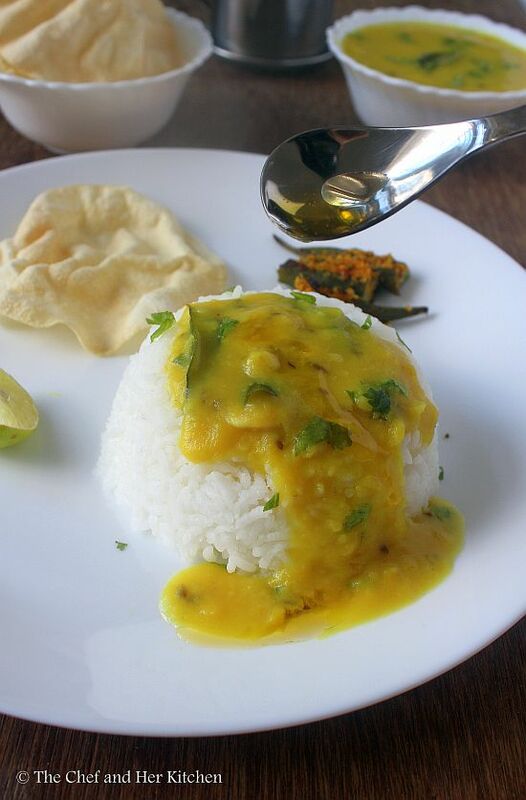 We do not add garlic to the dal if we are preparing it on a festival day , otherwise we do add garlic in tempering which gives a nice taste to the dal. 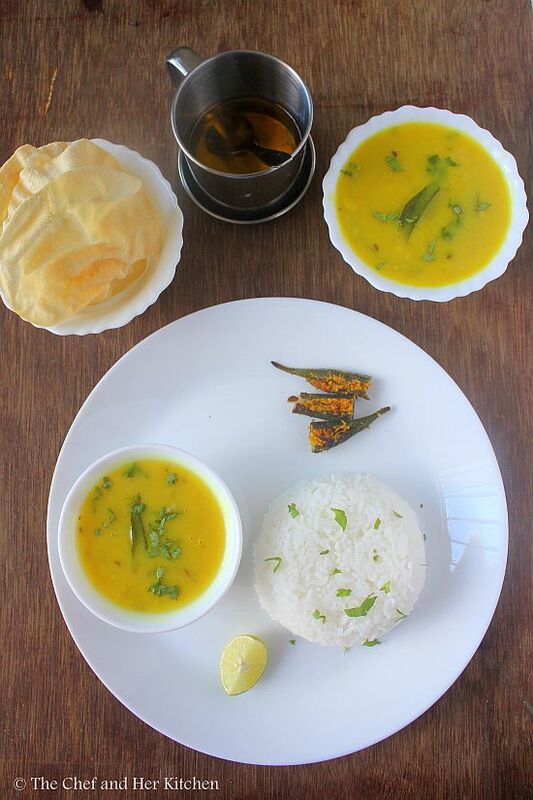 Varan Bhaat is the most comfort food for many of us,a big ladle of Varan served on a bed of piping hot steamed with a dollop of ghee and a vegetable fry(or fryums/papads) is what I crave at times especially after coming back from a vacation or if I am lazy cooking anything elaborate. Varan Bhaat reminds me an incident which happened many years ago when I was new to Mumbai. We had gone to a famous Maharasthrian joint for lunch and I wanted to try something new as I was new to Mumbai then and also new to the cuisine. My TH had ordered poori with a side dish which was safer bet where as an adventurous foodie ie., me wanted to try something new and was fancied by the name ' Varan Bhaat ' and chose the same to order. I knew that it would be a kind of rice variety as we are familiar with various bhaat varieties like Vangi bhat, Bisibelebath, Kharabath. But it was a total surprise for me when the waiter got me a plate of Varan Bhaat which consisted of simple Toor dal with a bowl of white rice and a dollop of ghee. TH could not stop laughing at me that day and had ordered another plate of puri for me too. The idea of trying something different had ended up making me tasting a humble dal chawal in the restaurant. Wash and soak the toor dal in enough water for 15 mins. Add turmeric powder and pressure cook it for 3-4 whistles. Once the pressure drops remove the extra water(if any) and mash it nicely using a wooden ladle. In a small pan heat ghee/oil and crackle cumin seeds and add slit green chillies, curry leaves ad hing and fry until done and add dal to it and let it boil for 3-4 mins. Add coriander leaves to the dal. Wash the rice a couple of times and soak it in water for half an hour. Drain the water and add 4-4.5 cups of water.Pressure cook it for 3 whistles. I usually do it in rice cooker then I add 2.5 cups of water for 1 glass of rice. If you are doing it in pressure cooker you can add 4 cups of water (for 2 cups rice) if you want separate grains of the rice.If you want it soft add 4.5 cups for 2 cups of rice. 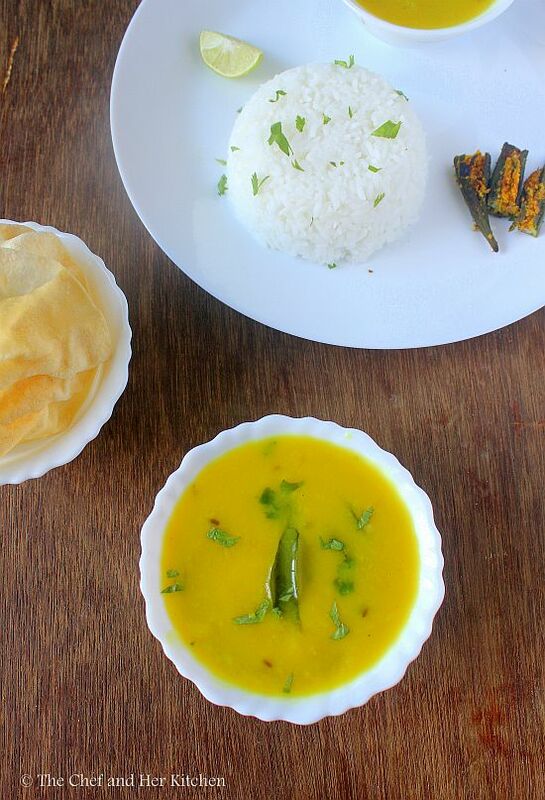 Serve the varan with piping hot steamed rice with a dollop of ghee and a lemon wedge.You can serve a simple vegetable fry or pickle and papad along with it. If you want you can add tomatoes while cooking the toor dal. You can add garlic in the tempering if you want. But if you are preparing for naivedyam skip garlic in it. Instead of green chilli you can add red chili or red chili powder in tempering. You can add mustard seeds in the tempering. Few versions of varan has coconut in it.You can add either ground coconut paste while simmering the dal or add grated coconut at the end. 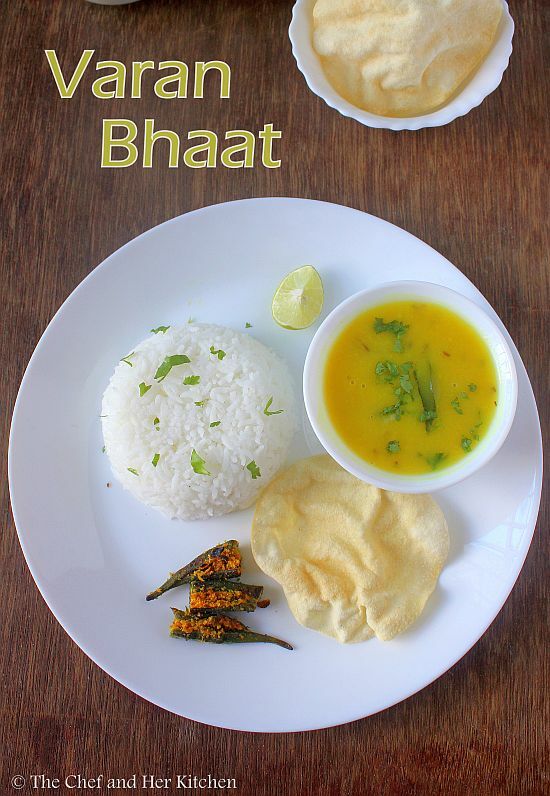 You can even use basmati rice for bhaat, in that case add 2 cups of water for 1 cup of rice. Nice dish presented very nicely by you with excellent images.